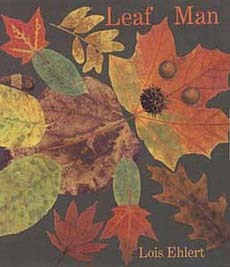 In this "eye-catching picture book" (School Library Journal), a Leaf Man made from fallen leaves flies through the skies on a breeze, observing fields of fall vegetables, prairies at harvest time, and other autumn scenes. The storyline is a simple one. The real standout is Ehlert's illustrations, made almost entirely from leaves of different shapes and sizes. Once you read this book, your students will never see leaves the same way again! In fact, they'll probably want to make their own leaf pictures (see the 'peak inside' section below for more). Publisher's Weekly called this book "a visual feast" and SLJ finished its starred review of the book by saying, "While the story is simple, the artwork is dazzling, and the book's concept will inspire nature walks, art projects, and curiosity about the changing seasons." Here's a sample spread from inside this book. Trust us, your students will be so excited to see that the pictures are all made out of leaves. 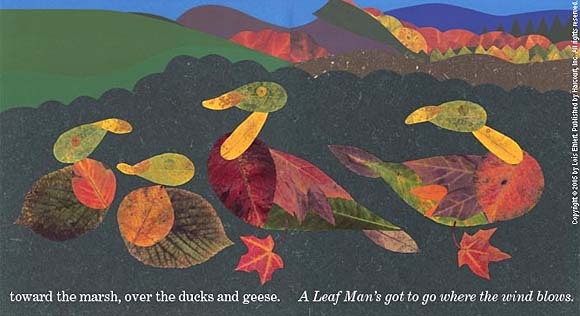 They'll probably want to try and make leaf illustrations of their own after seeing this book. (If you don't live in a climate where leaves fall, you can get fake ones for pretty cheap, like these mini fall Maple leaves at Amazon.com).